Was thinking today about how I hate being bored, absolutely hate it. I am Type A-B – I strive to be an A but lack the needed inner drive that would put me over the top. Being bored is a state of mind that I abhor and will do anything to avoid. My motto should be “Amuse thyself!” Supermarket lines – long one’s can’t stand them. I breathe a sigh of relief when I get close the conveyor belt and the tabloid section. I am up to speed about the doings of the Royal Family. And I know what everyone else knows about Angelina Jolie, though (also like everyone else) I am mystified by her. She’s working to make the lives of poor children better but just spent $25million on the house that film-maker Cecil B. DeMill used to own. Does not make sense. And so here I sit, in the Museum of Transportation and Industry, watching a rehearsal of An Alaskan Home Companion. Last year my friend Betty and I did a skit – about her being a hair dresser and me being a client. No one laughed. We both decided that it was a bust. Betty was more upset about our lackluster performance than I was. I figured it was small change, just a handful of pennies. This was not the big time. It was the small time. So here I sit, watching opening acts and thinking of things I might do to keep myself amused for another three hours. I’ve been working hard to keep boredom from having a stranglehold on me. 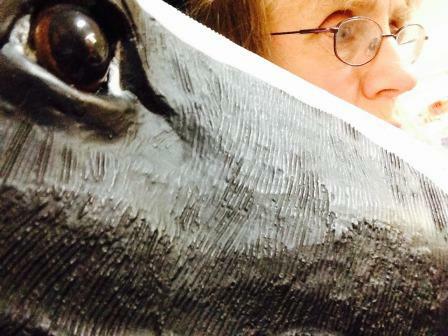 I am sitting next to a huge Plexiglas Holstein cow. It has a hat on its head. I took a photo of me with it – a selfie for this dispatch. I ate some food. I edited the script and will hand it over to the producer. The thought that I will soon be heading home is really what’s keeping me from pulling my hair out of my head. Hell must a place where one is bored for all eternity and then some. It’s the parallel railroad tracks again meeting in infinity. My being here is my own doing. If I wanted to be involved in this production I should have said when first asked that this show is not funny – it is boring. Or, I should not have gotten involved at all. Discretion is the better part of valor. I could have remained a hero on my own home front. Odd, that some people equate being home with being bored. Bring on the animal chores. Bring on the writing projects. Bring it all on and I will be occupied and happy. I feel the underlife surfacing. An idea, a book or series of essays about being bored in differing places, say, in a train station or a post office. Different locale, same emotive qualities. Went to the dentist today. Waited half a minute before my appointment. And I was early. Not bored. But I had a book handy just in case.